AAA-Grade perfect round cultured pearls set in solid sterling silver. 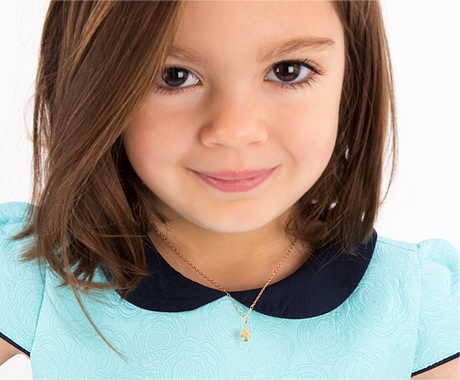 Perfect, simple and charming earrings that every little girl should have in her jewelry box. From audrey hepburn to jackie kennedy, they are the perfect accessory for every girl. Love them! Purchased these for my 3 year old daughter and they are perfect! They came with a storage bag and polishing cloth. These earrings are super cute. I bought them for my 3 year old, She LOVES them. Perfect size - not to big not to small for my 2 year old. The screw back is also durable a little trouble initially getting it on but once it was on it was very secure and holds up through all my daughters toddler activities. My daughter and I LOVE her pearl eaarings. We have gone through a lot of earrings and I'm so excited to have found the perfect pair. The backs stay on and the quality is great!! My daughter is 4 and petite, I ordered the 4 mm sterling silver pearls and they are the perfect size for her!!! Also, the packaging is very nice. Thank you Tiny Blessings for amazing jewelry for my little girl! My mother in law got me to purchase these for my daughter's first birthday. They are the perfect size for my one year old. Not to mention the package was adorable! These earrings are perfect for a sweet granddaughter's first birthday. The size is just right and the screw-on backs have stayed secure. The packaging was classic. I would definitely recommend these earrings and this vendor to friends and family! Love the fact that the earring backs are safety screw on. Good quality, fast shipping! perfect earrings for my baby girl! I originally was going to get the 3mm but glad I went with these. They are perfect for my 4 month old. I loved it and they look beautiful on her. Looking to buy again in the future! I ordered these beautiful pearls for my granddaughter's baptism gift. They are the perfect size for a small child, yet she will be wearing them for years to come. I received them fast and elegantly boxed for gift giving. With this outstanding quality for an excellent price, I will be ordering again! I bought pearl earrings for my 1 year old niece. They were processed and delivered quickly. Beautiful packaging and beautiful pearls! The earrings are beautiful and exactly what I wanted. The size is perfect for my 1 yr old! The pearl earrings I bought for my 1 yr old are amazing and the package they came in was gorgeous. My daughter has the habit of pulling her ears so they are perfect and beautiful too. Bought these as a Baptism gift for my Goddaughter & they are just beautiful! Everyone loved them! & I love that they grow with her. These are exactly what I was looking for. I needed something for my almost 2 year old that would stay on and these were perfect and great quality. Would recommend. I bought the 4mm and they are really nice but they seem really small even for a baby. The wrap and package were really nice and makes it look as a expensive item. I haven't given it to the baby yet so can't comment on other details. Delivery was extremely quick! Love that. These were perfect for my daughter. I ordered the "Crowned in Heaven Christening Name Bracelet" and "4mm Pearl Studs". I was so pleased when I received my package. Not only was it shipped in a timely manner, it was packaged with care. My baby girl looked beautiful in her new jewelry. I highly recommend Tiny Blessings and I would surely order from them again. Bought these earrings for my 14 month old granddaughter. They are the perfect size for her age. Originally got the 3mm but they were tiny...probably best for an infant. These earrings stay on, hold up to every day wear and washing of a very busy one year old! Response time from online order to delivery to my door was two days!! Earrings came in a beautifully ribbon tied box with material info, cleaning info and polishing cloth. The return process for the 3mm was seamless and credit to my credit card was quick. Am very happy with the product, company and customer service. I will order additional items from this company in the future...just need more granddaughters!!!! Item purchased for 5 year old - great. Great quality earrings, received very quickly!